Understanding population structure is important for guiding ongoing conservation and restoration efforts. The greater sage-grouse (Centrocercus urophasianus) is a species of concern distributed across 1.2 million km2 of western North America. We genotyped 1499 greater sage-grouse from 297 leks across Montana, North Dakota and South Dakota using a 15 locus microsatellite panel, then examined spatial autocorrelation, spatial principal components analysis, and hierarchical Bayesian clustering to identify population structure. Our results show that at distances of up to ~240 km individuals exhibit greater genetic similarity than expected by chance, suggesting that the cumulative effect of short-range dispersal translates to long-range connectivity. We found two levels of hierarchical genetic subpopulation structure. These subpopulations occupy significantly different elevations and are surrounded by divergent vegetative communities with different dominant subspecies of sagebrush, each with its own chemical defense against herbivory. We propose five management groups reflective of genetic subpopulation structure. These genetic groups are largely synonymous with existing priority areas for conservation. 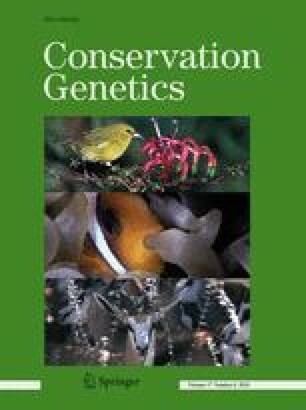 On average, 85.8 % of individuals within each conservation priority area assign to a distinct subpopulation. Our results largely support existing management decisions regarding subpopulation boundaries. The online version of this article (doi: 10.1007/s10592-016-0872-z) contains supplementary material, which is available to authorized users. This research would not be possible without the many state, federal, and NGO biologists and technicians who have spent countless hours working tirelessly in the field and behind desks for the conservation of the greater sage-grouse. We would specifically like to acknowledge Jake Chaffin (BLM, now USFS), Ben Deeble (Montana Audubon), Brad Fedy (University of Waterloo), Rick Northrup (MTFWP), Sara Oyler-McCance (USGS), Aaron Robinson (NDGFD), Travis Runia (SDGFP), Dale Tribby (BLM), Catherine Wightman (MTFWP), and David Wood (BLM). Our molecular genetic analyses and manuscript preparation would not have been possible without the assistance of Kevin McKelvey, Kristy Pilgrim, Cory Engkjer and the tireless laboratory efforts of Kara Bates, Nasreen Broomand, Taylor Dowell, Scott Hampton, Randi Lesagonicz, Inga Ortloff, Sara Schwarz, Kate Welch, and Katie Zarn, all of the USFS Rocky Mountain Research Station National Genomics Center for Wildlife and Fish Conservation. Use of trade names does not imply endorsement by the U.S. Government. The views in this article are those of the authors and do not necessarily reflect those of their employers. This study was supported by grants from the Montana and Dakotas Bureau of Land Management (07-IA-11221643-343, 10-IA-11221635-027, 14-IA-11221635-059), the Great Northern Landscape Conservation Cooperative (12-IA-11221635-132), and the Natural Resources Conservation Service—Sage Grouse Initiative (13-IA-11221635-054).